How was your training process? – My training preparation went very well! I followed the same program that I did for WAL finals, but now I'm 20-25% stronger on every exercise! Can you say that preparation for Vendetta was different and better then preparation for any other championship? – The preparation was definitely better, because I had a longer period to train. I improved my overall strength as well as my endurance!! I'm also, about 15-20 lbs heavier than I was for WAL! I started training with the BFR (Blood Flow Restriction) cuffs 6 weeks before WAL & then started back 12 weeks ago!! They have made a HUGE difference in my strength & recovery. Did you keep track on you rival, Andrey Pushkar? What conclusions can you draw about him? – I didn't see any footage or pics of Andre until a couple weeks ago. From what I see he looks to be in great condition!! What do you expect from this Vendetta? – I expect to face a very strong Andrey Pushkar who will try to finish the match quickly! I believe I'm strong enough to stop his hit before he pins me and then we will see who wants to win the most!! I expect this to be one of the best matches of the event! 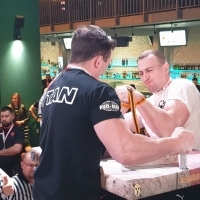 My main reason for asking for this match, is I want to be recognized as the Overall #1 Armwrestler in the World & to be the man, you have to beat the man! !